ACDF is one of the most commonly performed spine surgeries. It is a surgical procedure done from the front of the neck (hence, anterior), during which the surgeon removes the abnormal disc (discectomy) and fuses the bones using a spacer, plate, and screws. The goal of ACDF is to remove pressure from the nerve structures, correct spine deformity and abnormal movement between the bones. Patients with narrowing of the spinal canal (stenosis) may develop pinched nerve causing arm pain (radiculopathy) or compression of the spinal cord leading to its dysfunction (myelopathy). Indications: what conditions are managed with ACDF? Neck deformity (scoliosis or kyphosis). A one-inch incision is made just to the side of the midline over the abnormal spine level. Internal organs including the airway, esophagus, nerves and blood vessels, are pushed to the side and protected. The front surface of the spine is exposed, and the abnormal disc is removed. The disc bulge and bone spurs are then removed. The vertebrae (spine bones) are spread apart and fused in place using a spacer (a cage or a piece of cadaveric bone) and secured in place with a plate and screws. What are the risks of ACDF? In most patients, above 90%, the surgery goes very smoothly, and there will be no complications. As with any surgery, there are some risks, however. Some are common to any operation, including infection, failure to improve, bleeding, injury to the nerves, need for more procedures. Deterioration of the vertebral discs located immediately next to the operated level requiring surgery in the future. Will there be a big scar? For one-to-three level surgery incision is typically made horizontally. It permits to hide incision in a natural skin folds and makes it less noticeable. For the first several weeks the scar may be pink, but over time it fades and is less noticeable. Since the scar may be sensitive to light, we suggest you do not expose it to direct sunlight and use sunblock. What are the typical limitations after the surgery? As with any fusion procedure, our recommendation is to avoid excessive activity for three months after ACDF (bone healing takes on average 6-12 weeks). Remember: no BLT! Certain medications may slow down bone healing and should be avoided. These primarily include anti-inflammatories such as ibuprofen, naproxen etc. How much range of motion will I lose? There is a relatively small range of motion across one cervical disc: between 5 and 10 degrees. Fusion of one disc space typically is not noticeable. With more levels fused, one may notice some stiffness, but usually, it is debilitating. After the surgery, most people feel good and are ready to go home. Considering the risk of hematoma formation (collection of blood in tissues), I always observe all my patients in the hospital and discharge them home the following morning. Since surgical approach does not require cutting through a large amount of muscles, most people have only minimal pain. Are there alternatives to ACDF? 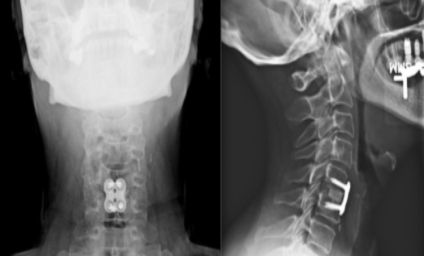 Anterior cervical corpectomy and fusion. Who should not have ACDF? Smokers may have delayed bone healing, as such nonfusion procedures may be more appropriate in them. What should I know in preparation for surgery? We have a standard preoperative protocol that we follow with all our patients. You can find it following this link. If you find the information on our website helpful, please share it with your friends and sign up for our newsletter.